GATES will bring together consumer tech channels - top Retailers, E-tailers and Distributors from 10 countries - for meetings with vendors, conference and gala awards; 20-22 March 2019 in Bangkok. 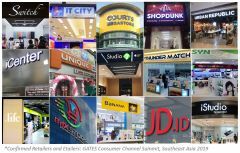 BANGKOK, THAILAND / SINGAPORE, Jan 23, 2019 - (Media OutReach) - Organizers of GATES Summit announce the next event will unite consumer technology channels across Southeast Asia. GATES will bring together international technology vendors with top channel executives from ten countries in the region -- the retailers, e-tailers and specialist distributors who drive the consumer technology business in this large, dynamic marketplace -- for meetings, conference, business networking and gala awards.